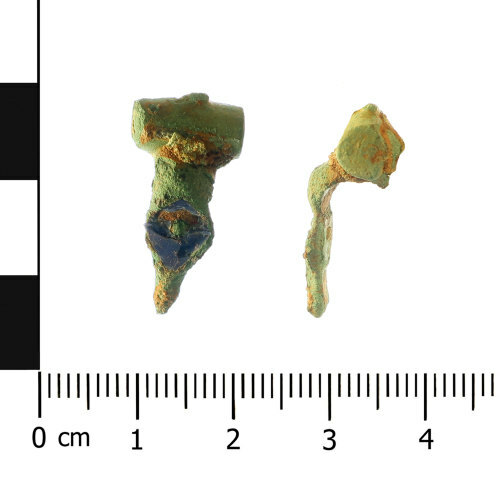 Roman brooch of Trumpet variation (Mackreth 2011, Chap 5, Part 3, Group 3.3b, Plate 86, ADc.75-180). The copper alloy brooch has a rectangular spring-case with a trace of what may have been an integral loop on the upper edge. Within the case there is a copper alloy axis bar and spring which is coiled four times. The pin is incomplete. The bow protrudes from the lower edge of the case. Thew bow is semi-circular in section which flattens out to form a sub-oval disc which has blue glassy enamel with a pellet in the centre. Only a fragment of the lower edge of the bow remains. The surface of the brooch is abraded and has a traces of a light green patina. It measures 23.06mm in length, 11.51mm in width, and weighs 2.22g. The brooch is a Trumpet derivative 'Knop Replaced by Flat Plates' type which Mackreth classifies this type as Chap 5, Part 3, Group 3.3b, Plate 86, ADc.75-180.